Ron and Jenny Linkins, who dispatch your copies of Updates, recently attended a fundraising and awareness day for prostate cancer. 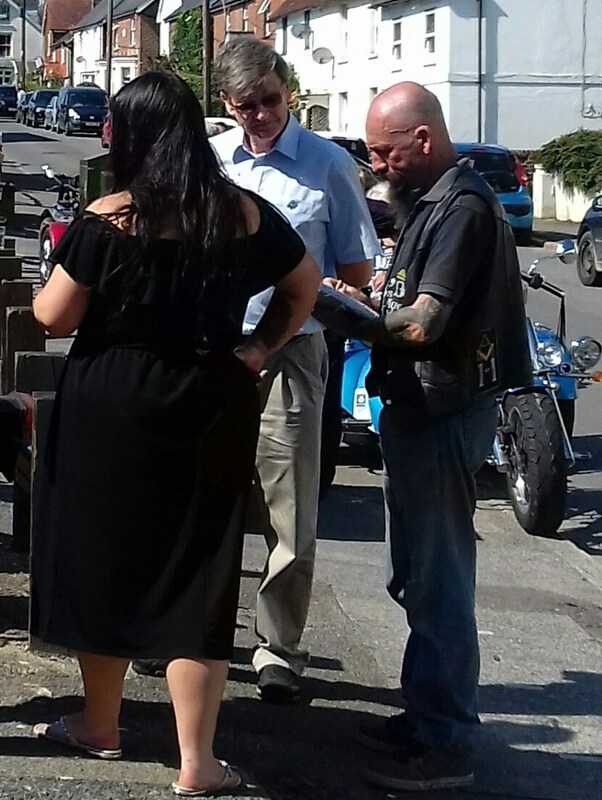 Organised by Wulf Yapp from the Artificers Masonic Motorcycle Association (AMMA), it was held at the Woolpack in Herstmonceux in early September. 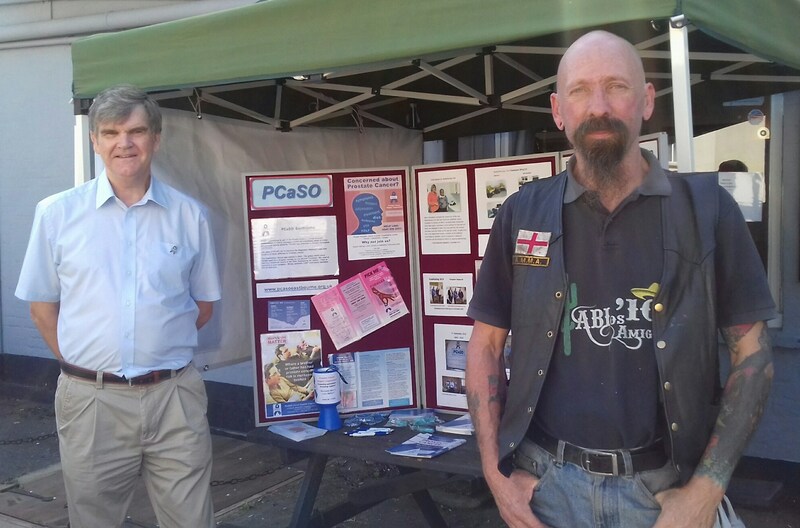 “We were pleased to represent our local Eastbourne PCaSO group at this function, especially as both a prostate cancer patient and brother Mason, Ron felt he would have something in common with those attending. Our initial trepidation on arrival was quickly dispelled by the friendliness of our welcome and we soon set up the display under our allocated gazebo in an excellent position right next to the entrance to the bar. After enjoying our BBQ pub lunch, Ron was honoured to be chosen by Wulf to help him and the pub landlady judge the bikes in various classes. 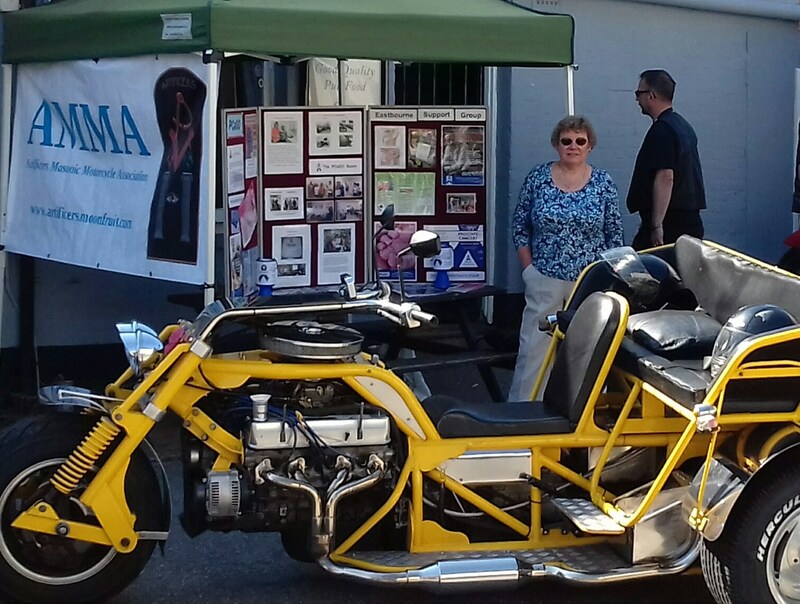 “We enjoyed meeting many of the bikers and were able to share with them and their wives our own experiences. Many men need nagging to seek medical advice. We also gave out the blue and pink PCaSO general information leaflets encouraging awareness of men’s health and the importance of PSA testing. We had photocopied details of the PCaSO PSA testing dates which many took away to share with their own Masonic lodges. A member of Ron’s lodge (Hadrian 2483) visited us at our display. The lodge is currently organising a group outing to the upcoming PCaSO Peacehaven testing event. AMMA generously raised £214.75 for the PCaSO Eastbourne support group at this event. With thanks to Wulf and his team at AMMA.